HomeArticlesWhy do Shias celebrate Eid-e- Ghadeer? A question that the general Muslims often pose to the Shias – Why do Shias celebrate Ghadeer? What is so significant about the event that merits such pomp and splendor? 18th Zilhajj is the great day which the Shias consider as Eid-e-Ghadeer and celebrate by creating an atmosphere of extreme elation. Some people begin their preparations well in advance for this joyous occasion. The effort and hard work of innumerable researchers and scholars are devoted to this event. An objection is often raised as to why so much physical and mental effort is lavished on this event. If similar effort and hard work is instead invested in ironing out flaws related to education and society, it will be more beneficial for Muslims. After all, which social problem has been solved by the annual celebration of Ghadeer? What good has it done to the community by persistently confirming the successorship and absolute mastership of Ameerul Momineen Ali b. Abi Talib (a.s.)? Is it not better that we find a remedy to the various problems plaguing Muslims and let bygones be bygones? This is not a new objection. The enemies of the Shia Isna Ashariah have made an issue out of this for several generations. Not surprisingly, the enemies have raised the objection keeping in mind the Shiite ideology. In this regard, they have learnt the tricks from the enemies of Islam because when the enemies of Islam and the Majestic Quran raise objections against Islam, they use similar tactics. For example, they say that why do we spend so much effort and wealth on religious customs such as prayers, fasting, recitation of Quran, etc. instead of spending it on economic growth and advancement of the community. Honestly speaking, by visiting the House of Allah every year and by persistently establishing the veracity of Quran and Islam, which of the ever-increasing problems and tribulations of the community has been resolved? 1.Â Â Â Â Â Â No act should be looked at only from its materialistic perspective. It means that if a thing is useful, then itâs being useful is not just materialistic. 2.Â Â Â Â Â Â An event or incident cannot be rendered insignificant due to its being historic. As far as the first point is concerned, it should be known that knowledge and understanding are very critical for human growth. Even today, well-known universities teach the philosophies of Aristotle and Plato notwithstanding the advancements in science and technology. We see intellectuals achieving success by deriving benefit from the views of these individuals. All parents invite their children towards truth and consider lying detestable and command their children to stay away from it. Is such an upbringing not useful for human beings? Is its benefit materialistic? A copy of the Holy Quran is available with every Muslim family as a mark of it being divine and Muslims recite it regularly whereas all Muslims are well aware that recitation alone is not sufficient and it must be accompanied by pondering and contemplation. But it is a fact that the mere recitation of the Holy Quran guides us, brings us closer to Allah and solves our problems related to the world and the Hereafter. Similarly, there is one more fact, which is related to the past and its extraordinary importance has been proven even in times to come. This is âMaadâ i.e. the Day of Resurrection and Accounting along with details are realities discussed in the Holy Quran.Â It carries so much importance that it draws our attention immediately. All of us endeavour to perform actions so that we are saved from the fire of Hell. Recitation of the verses concerning Maad and the traditions of Holy Prophet (s.a.w.a.) leave a profound impact on our activities, making us more focused. No Muslim can deny this despite the fact that the belief in Maad has no materialistic benefit and has not solved any long-standing problem afflicting the Muslim community. The same applies for Islamic beliefs in Tauheed and Prophethood. It is evident from these examples that the importance of an Islamic belief cannot be benchmarked against its materialistic impact on Islamic society. Similarly, an event cannot be termed insignificant merely because it is historic. There is much to learn from the early history of Islam. The manner of revelation of Quranic verses, cause of descent of certain verses, ethics of the Holy Prophet (s.a.w.a.) are all rooted in history. By ignoring history, we stand to forfeit the wonderful benefits of all these events. After all, Hajj is nothing but a series of rituals to commemorate historical events related to Hazrat Ibrahim (a.s.) and his family hundreds of years before the advent of the Holy Prophet (s.a.w.a.). Can any Muslim deny the importance of Hajj and Ziyaarat? Millions are invested both by the pilgrims visiting the shrines in Makkah and Madinah and the caretakers of these shrines. Governments in many countries, including India, subsidize the Hajj. All this money and effort is invested only to commemorate an historic event that preceded Islam by hundreds of years. Which problem of the Muslim society has been resolved by Hajj? Wouldnât it be more advisable to invest this time, effort and money in areas that have a tangible impact on Muslim society? The answer to such baseless objections is that we should stop benchmarking the importance of an event by its impact on tangibles and materialistic gains. It has been noted several times in the Noble Quran and the Sunnah that Islam focuses on the afterlife and all our actions must be performed for the Hereafter regardless of whether we see any tangible benefits in the world. Whatever Shias accomplish or narrate pertaining to Ghadeer is based on this very philosophy. 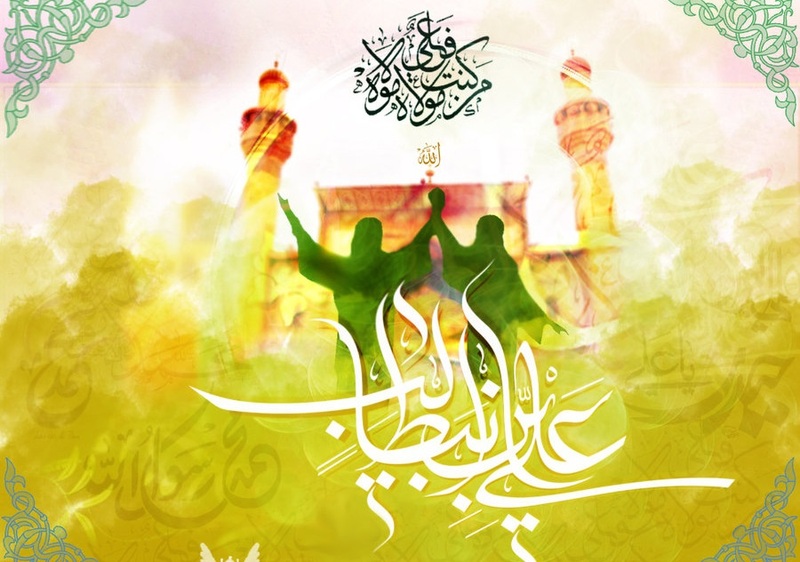 The Shias consider Ghadeer to be significant and regard it as esteemed and blessed because although Ghadeer is rooted in history, it has given Islam the critical belief of Imamate and Mastership, which is among the pillars of religion. Undoubtedly, the Holy Prophet (s.a.w.a.) made this declaration on the day of Ghadeer. Ghadeer-e-Khumm is an event, the celebration of which instills the Mastership and love of Ameerul Momineen Ali b. Abi Talib (a.s.) in the hearts and minds of people. Just as the Prophethood of Holy Prophet (s.a.w.a.) is definite and conclusive, similarly, the incident of Ghadeer is also certain and irrefutable, the origin and source of which can be found in the books of history. Does this reality and the special arrangement by the Holy Prophet (s.a.w.a.) not merit a special mention and an extraordinary commemoration? On divine command, the Holy Prophet (s.a.w.a.) appointed Ali b. Abi Talib (a.s.) as his successor and made his obedience obligatory upon every Arab, non-Arab, young, old, white and black. On the day of Ghadeer, Holy Prophet (s.a.w.a.) enforced the order and command of Ali (a.s.). He considered his enemies accursed and regarded his lovers as successful and having achieved salvation. Ameerul Momineen Ali (a.s.) is a successor of the Holy Prophet (s.a.w.a.) even in the exegesis of the Holy Quran and is also a bearer of the Prophetâs knowledge. He is the leader of guidance and Allahâs wrath and curse is upon his enemy. These were some of the attributes of Ameerul Momineen (a.s.) which Holy Prophet (s.a.w.a.) had described to the people at length in the Sermon of Ghadeer. Therefore, isnât striving to achieve the recognition and knowledge about Ali (a.s.) and bringing people closer to his recognition equivalent to firmly establishing the foundation of belief in Islam and Holy Prophet (s.a.w.a.)? Once he is recognized and it is known that Ameerul Momineen Ali (a.s.) is the Imam and Master from the side of Allah, then shouldnât the day when the last Prophet (s.a.w.a.) introduced him and completed his mission of guidance be celebrated with utmost pomp and splendour? The aforementioned sermon also amply disproves the argument of those who believe that there are no material benefits of celebrating Eid-e-Ghadeer. What can be a greater material benefit than long life with wealth and affluence along with the acquisition of divine pleasure? Accordingly, it is evident that celebrating Ghadeer is neither a foolish act nor can it be considered to be futile and fruitless. If, God forbid, we consider it to be futile and fruitless then, it will be tantamount to rendering as fruitless and futile Allahâs choice and Holy Prophetâs (s.a.w.a.) admonition to the Muslims. Indeed, we celebrate Ghadeer under the light of the traditions of Ahle Bait (a.s.). This celebration, even if apparently devoid of any materialistic aspect, is certainly a means to attaining proximity to Allah, His Messenger (s.a.w.a.) and the Ahle Bait (a.s.).